I've been picking peas for a week now but I finally realized I have been slack in watching for aphids on the peas. Now they're everywhere, mostly on the undersides of the leaves making spraying them off with water tough to do. 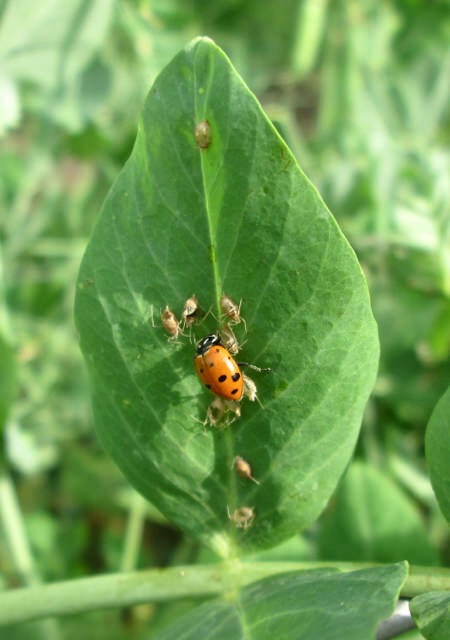 Plus now there are lady bugs everywhere on the peas and also some lady bug larvae so I don't want to mess with them. I guess I'll leave them all be. It's only a two to three week picking season anyway. Better to have more lady bugs. BUT... I did spy some aphids on the top of one leaf and there was one of the ladies in the midst of an all-you-can-eat aphid buffet. Last edited by clkeiper; May 17, 2018 at 10:23 PM. Thank you! It's just a small Canon Powershot camera and it goes to the garden with me all the time just in case I find something interesting. Then I crop, touch up the contrast, light levels etc on my iPhoto program. That aphidy pea bed has one more light picking tomorrow and then it will be ripped out. The other bed still as one or two nice pickings left. So far, seven pounds of shelled peas have been stashed in the freezer. Yeah, I've been like many others in that I've felt powerless before when seeing bad insects in my garden and so the first time I saw lady bugs going crazy it was quite euphoric! Nice detail though for sure with the camera!